Promotional Jade Light Up Glow Sunglasses are ideal options to make your night time promotional events and celebrations attractive. These custom party sunglasses are presenting 3 LED functions which are slow flash, quick flash and also steady. These CPSIA complaint custom sunglasses are also bringing 3 replaceable AG3 batteries along with the pack to ensure extended life. One size fits most; the 2" x .3" imprint area is more than enough to showcase your brand logo exceptionally. Order now to grab our free online proofs and free artwork design services. 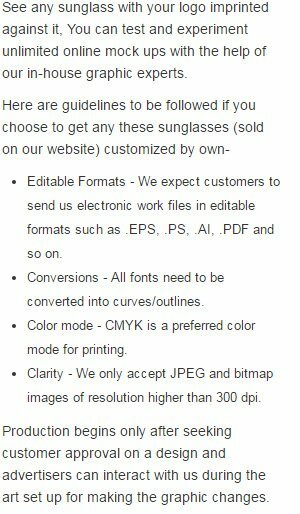 Request a quote to know price cuts that you can avail for wholesale Promotional Jade Light Up Glow Sunglasses. Additional Information: Includes three replaceable AG3 batteries, CPSIA compliant and the product is not suitable for children under five years of age.